"Take work away from me, and what am I, a car without a motor. A living corpse." After working his way up through the ranks of Universal pictures, William Wyler finally got a chance to do an 'A' picture in 1933. With one of the biggest stars of the day, John Barrymore, and a screenplay by Elmer Rice, he got his career off to a highly auspicious beginning. High-powered New York attorney George Simon (Barrymore) is a nonstop mass of contradictions. Working like mad, he still makes time for his high society wife Cora (Doris Kenyon). He also engages in insider trading, blackmail and political shenanigans, while he still helps the lower classes from his own working-class Jewish origins. But when the white-shoe crowd of New York lawyers learns about an alibi that Simon concocted years before, he is in danger of losing everything: his license, his practice and his wife. Although there's a bit of melodrama here, the whole is capably shaped by the grossly underrated Rice from his own stage play. The dialogue fairly crackles, aided by the frenetic delivery of Barrymore. There's also an excellent supporting cast, headed by Bebe Daniels as Simon's faithful secretary who loves her job even more than he does. She's supportive and emotional without overdoing it, giving a nicely detailed portrait. Kenyon does fine work with the manipulative character of Cora, coaxing and wheedling Simon and then ready to abandon him at a moment's notice. 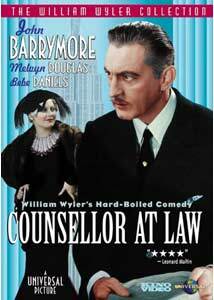 Melvyn Douglas as the ne'er-do-well who is interested in Cora is also worth noticing. As a practicing attorney myself, films about the legal profession hold a peculiar interest to me. This film harkens back to a time when a great attorney could be a general practitioner and not be specialized into a single area. The pace of the office is heady and breathless and while it may not be true to life, certainly instills a sense of what such a life might be like. It's interesting to see a film take ethical questions seriously, and many of them still ring with surprising immediacy today. The film to a certain extent betrays its stage origins. Except for a shot up the front of the then brand new Empire State Building, the entire picture never leaves the offices of Simon & Tedesco. Yet there are frequent enough cuts and a large enough variety of angles used that the result never quite feels claustrophobic or set-bound. The result is far more intimate than the stage play ever could have felt, taking good advantage of the differences between the stage and the screen. Whether this is attributable more to Wyler or Rice is debatable, but it succeeds admirably. Image Transfer Review: The full-frame picture looks quite good. There is a good range of grey levels, though the blacks tend to be a bit heavy, lacking in details. There's also some minor ringing present in the higher contrast moments. The print used is quite clean, but there are two jarring jumps where a few seconds of footage seem to be missing. Audio Transfer Review: The 2.0 mono track suffers from the mild hiss and noise that one would expect in a film of 1933 vintage. Dialogue is crisp and clear throughout. Music is present only during the opening and closing titles, and it is tinny, to no one's surprise. It could have been a lot worse. Extras Review: The sole extra is a set of over 40 photos, mostly behind the scenes, covering William Wyler's career from about 1917 to 1970. They're all nicely captioned and in excellent condition. The chaptering is a trifle thin, but adequate. A moving drama of ethics and compromise as a dedicated man reaches the end of his rope, while on the verge of falling from the highest heights, aided by some superb performances. The transfer is quite nice for material of this period, and there are some interesting photos covering Wyler's career.